There is a wide variety of nut drinks available now, including new Waitrose Unsweetened Almond Drink (£1.49/litre), but if you'd like to try making your own, this easy recipe shows you how. 1. 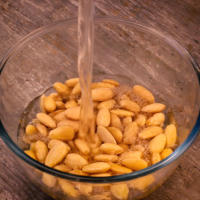 Soak the whole almonds in a bowl of cold water overnight. 2. Drain, then whizz in a high-speed blender with 600ml fresh, cold water until as fine as possible. 3. Strain through a sieve lined with muslin, gently squeezing out as much of the liquid as you can. The almond drink will keep for two days in the fridge and you can use the pulp in baking or sprinkle it on porridge.